Little did we know that we’d get to experience all THREE “challenges”!!!! It started out as a unusually warm for this time of the year (in the mid-50’s) but foggy day. Visibility was about 100 yds or so due to the heavy fog and slight misty rain. 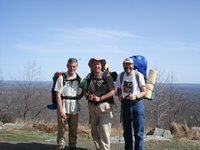 We four, Ed (WA3WSJ), Glenn (NK1N), John (NU2E), and myself started our hike into the Catfish Fire Tower about noon Saturday after parking at the gated access area at the bottom of the hill. 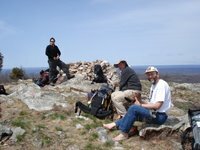 It took us about 30 min or so to hike the 1+ mile into the tower site since each of us were carrying a full backpack load. It was still misting as we set up our tents to operate the January PB Madness event starting at 3 pm locally and lasting 4 hours. 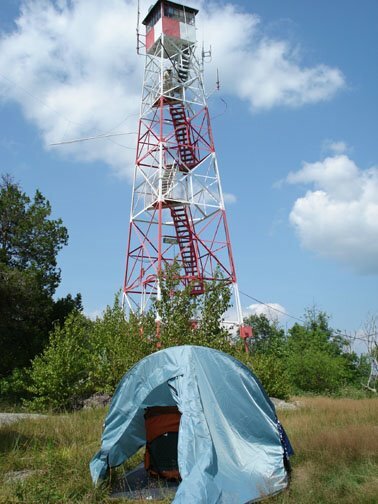 Most folks set up quickly; I setup up on top of the hill and hung my multi-band dipole off of the 65’ firetower….really an ideal antenna location for QRP activities since the average antenna height exceeds 35’. The weather forecast was for a cold front to pass in the late afternoon with the temperature to drop into the high 20’s overnight. 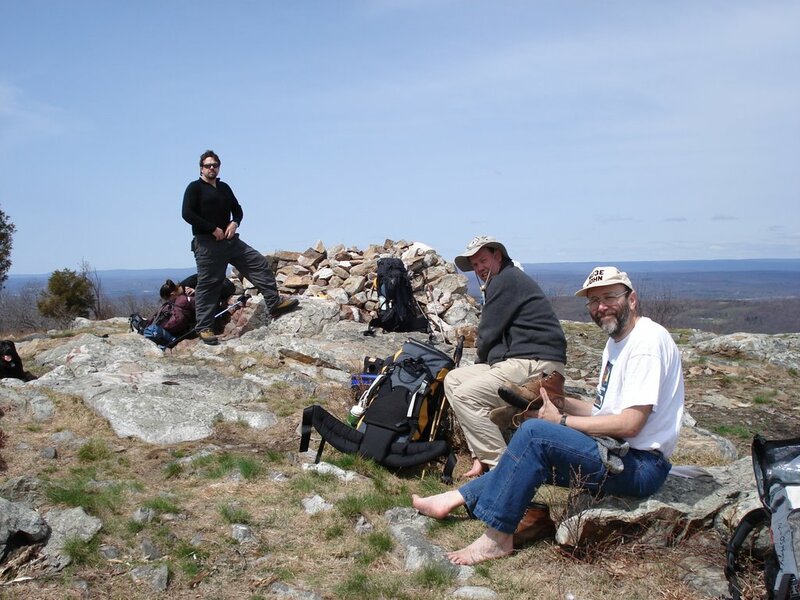 I was planning to spend the night on the ridgetop; the other guys were going back to the cabin at 6 or 7pm or so. So I was hunkered down for somewhat of a storm but not like anything that actually occurred….. The bands were in good shape. I was making a number of Q’s on 40m and having a good time in spite of an increasing wind and now a moderate rain. I peeked out of the tent to see how the other guys were doing; the sky was very dark to the west and the clouds looked menacing, similar to those violent thunderstorms of the Midwest. 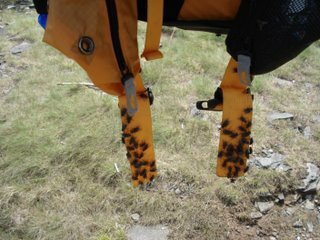 The wind was picking up and I re-anchored my tent pegs; I also tied the tent to several large 100-lb rocks as added assurance. Then the gust front of the weather front hit! I sounded like an on-coming freight train….to say “all hell broke loose” is an understatement. 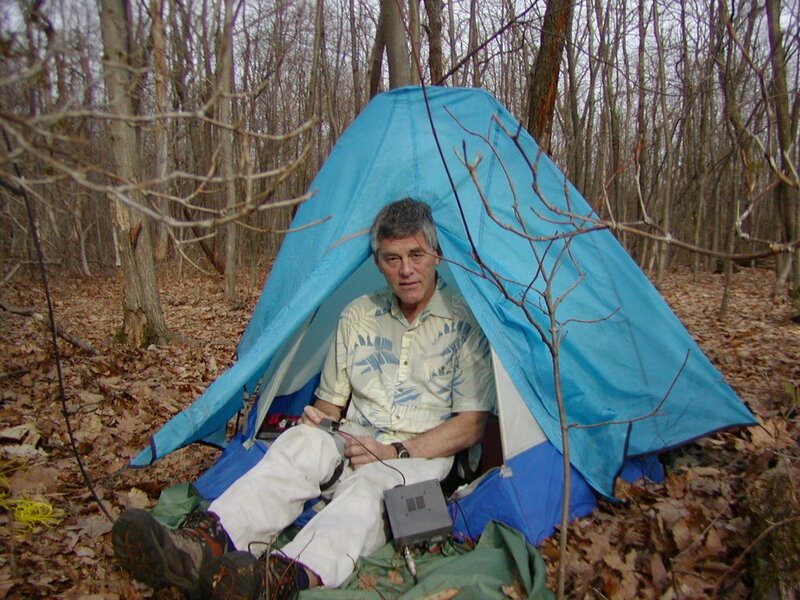 My four-season, mountaineering tent was bending in half and “thumping” loudly as it recovered between gusts. 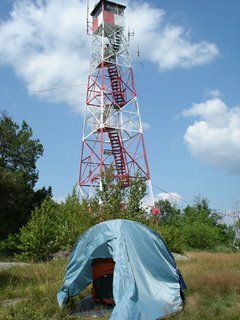 The wind was whistling through the steel framework of the firetower about 40’ away from tent site. Then the rain started, driven by the 60+ mph winds. It pounded my tent; the noise was unbelievable. I set aside my radio efforts…no way I could operate in these conditions. My concern turned to protection and survival. I pulled on my heavy raingear and went outside to find more 100-lb rocks to anchor my tent pegs and to check on the other guys. You could hear the heavy wind gusts coming up the ridgeside from the west as they tore through the trees lower down. 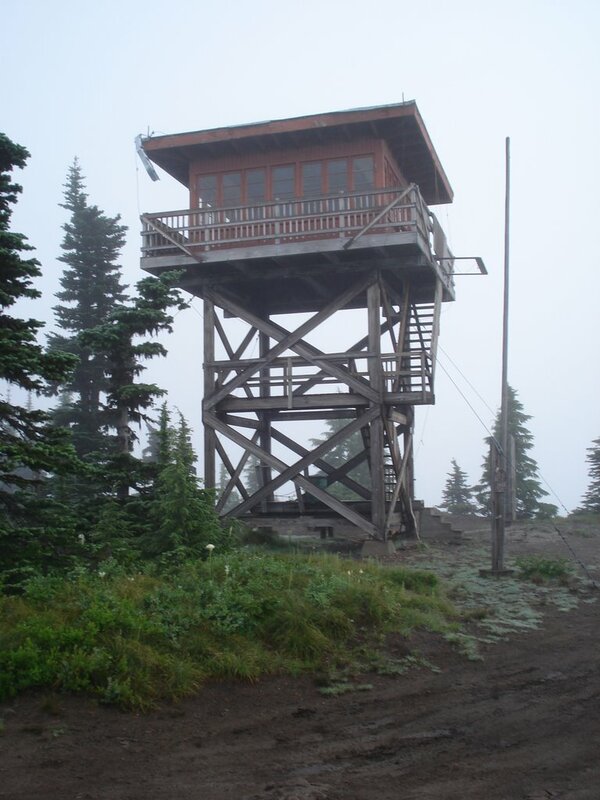 And then I watched the fire tower swaying with each gust…. Ed, WA3WSJ and John, NU3E were on the leeward wind shadow of the ridge; the heavy wind was going over top of them as they huddled in Ed’s tent. 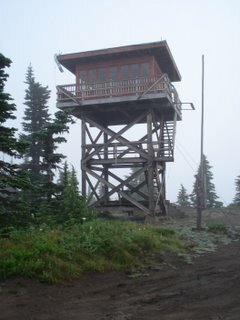 It was still raining hard but nothing like on top of the ridge. 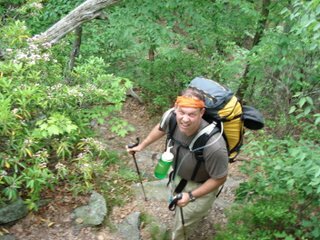 Glenn, NK1N, was up top on the ridge next to me. I went to check on him and found him a bit shaken but persevering. 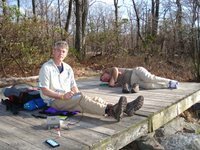 This was Glenn’s first trip with the Polar Bears….surely he was wondering if it’s always like this!! Or correspondingly, what have we got him into?? 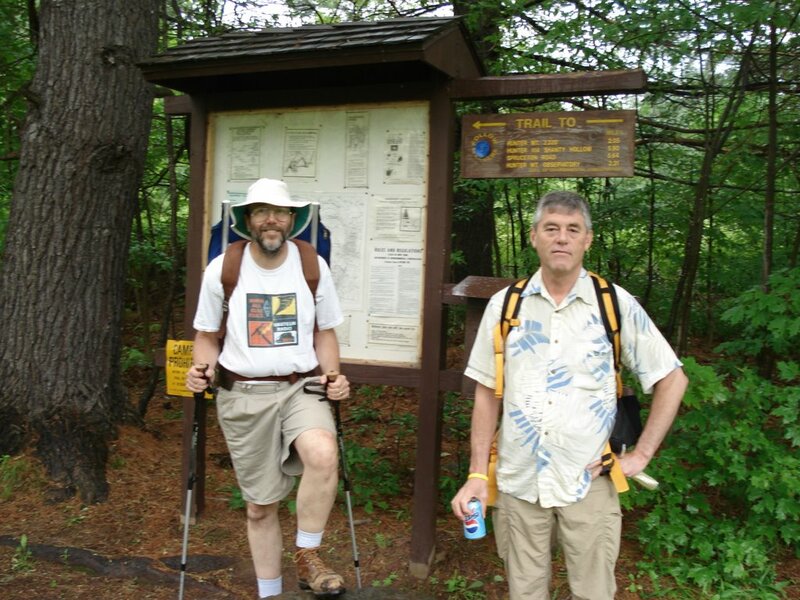 We got a break in the rain storm so Ed, John, and Glenn packed up quickly to get off the mountain. I had earlier communicated that “I was going to spend the night” so I stubbornly held to that conviction notwithstanding the gazillion mile-per-hour winds and heavy rain. The guys were quickly gone and the wind showed no signs of abatement. My dipole was still swaying heavily, the winds still gusting well over 60 mph, and now the rain turned to sleet and was pounding my tent. Soon there was ice covering everything and it had become nightfall or at least dark an hour before scheduled sunset due to the black, roiling clouds from the storm. 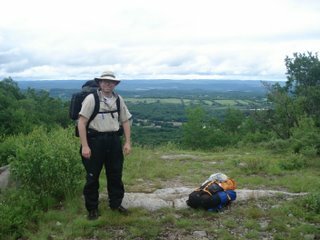 My tent was under constant attack, rolling to-and-fro as the wind collapsed the windward side and the loud “thump” as it recovered. By now I had 6 large, 50 to 100 lb rocks holding each tent peg down. The ice pellets on the tent was like the sound of a huge hail storm on your car. Ok. Let’s see who’s on the bands. The radio still worked and I was searching the 40m for a QRL frequency when the radio went dead….it was still on so it wasn’t the batteries. A few minutes of sleuthing narrowed to the antenna….I got my flashlight out and peered outside but really couldn’t see anything so I reluctantly went outside. It was sleeting heavily now and the ice pellets hurt as they pummeled my face and hands. Where’s my dipole? Well, the worst has happened. 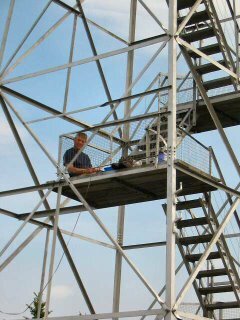 The dipole iced up and the heavy winds broke it loose from the fire tower connection at 60 feet. No way was I going to put it up, especially since you could HEAR the tower groaning and squealing as the winds buffeted the riveted steel structure. With no antenna, why I am I here? The answer was easy….let’s pack up and get out of here! First I tried to let the guy’s in the cabin know that “I was cumin’ in! !” but no answer to my FM call. Interesting, the link was a 59 copy before, why not now? 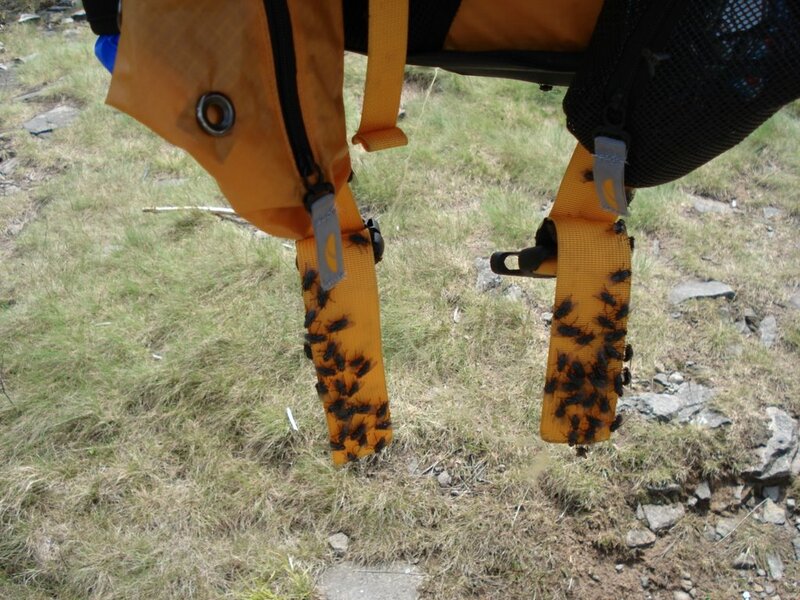 Notwithstanding that “small problem”, I crawled back into the tent and stuffed everything into the backpack. The tent was gonna be another problem….it was covered with ice and no way was it even going to roll up! The temps were now in the high 20’s, the wind still howling, and the sleet seemingly heavier than before! So I just “folded” the tent into this big box-size, cradled it under my arm and headed down the mountain. I’ll hike in tomorrow to get the dipole and coax!